John Briggs was born in Hainworth, Yorkshire, the son of a weaver, and was baptised at Keighley on 23 December 1770. He was married in 1792 at Haworth to Ellen Coates from Arncliffe. Much of his family history has been pieced together by a present-day descendant, Gordon Briggs, John's great great great grand-nephew, and it is his research which provides these essential dates. John and Ellen are thought to have lived for a while at Low Bridge, and their first two children were christened at Keighley church in 1795 and 1797. The following four children were baptised between 1800 and 1809 at Arncliffe, where John's wife's parents still lived, but it is thought that at this period John and Ellen lived at Gargrave, the wife going to her mother's house for confinement. Only two of the children are thought to have survived infancy, Joseph and Leonard, about whom more later. The oldest surviving piece of work so far known by John Briggs is, or rather was, a sundial, signed 'J. Briggs of Gargrave Fecit 1798 AD' with the inscription 'Sic Labitas Aetas' (thus age slips away). 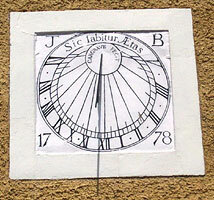 This sundial is on the wall of the former Post Office in Middleham, Yorkshire, now called Sundial House, but on fairly recent re-painting the name J. Briggs has been changed to JB and the date has been changed from 1798 to 1778. John is believed to have worked at Gargrave from at least 1798 to about 1834, by which time he is known to have moved to Market Place, Skipton. By 1841 he was living in Caroline Square, Skipton, and by this time he was a widower. He remained there the rest of his life, dying in 1853. The premises which used to be his shop were pulled down years ago and are said to have occupied the spot where the Midland Bank now stands. In 1841 widower John had a much younger, live-in housekeeper named Hannah Dibb, a spinster (apparently a single parent), whom he married later that same year. The 1851 census shows John aged eighty still living there, and still apparently working as a clockmaker, with his now wife, Hannah, aged fifty-five, and his stepdaughter, Mary Dibb. This big age difference between John and his second wife seems to have been the cause of friction within the family and there is known to have been bad feeling between him and his son, Joseph. Many clockmakers are known only through their surviving works and through such facts and figures as we can uncover about their lives. For some we have no more than mere guesses as to the approximate dates they worked, based on examples of their clocks we have seen. We consider ourselves lucky if we can learn the date of a clockmaker's birth, apprenticeship, marriage and death. When we are fortunate enough to have such basic facts, we often know precious little about his life itself, the conditions he lived in, his successes and failures, his ambitions, his loves, the tragedies of his life, his sins, his state of health, his family relationships. Often we have a gap from his starting married life to the date of his death, a gap we can only assume was filled by little else but work. In the past only the most successful clockmakers took a true 'retirement' in their later years. The average clockmaker had income only so long as he kept working - according to the census of 1851 John Briggs himself was still apparently working into his eighties! That was by no means unusual. The average clockmaker usually worked throughout his entire life, worked in fact till he dropped - or till ill health drove him into the workhouse. 1. Thirty-hour oak and mahogany longcase by John Briggs, signed at Skipton, dating from about 1840. Click for closer view. 2. Hood detail of the thirty-hour Skipton clock. Click for closer view. In the case of John Briggs, however, we know a little more than with most. John had numerous descendants, not particularly through his own two surviving sons but principally through the issue of his brother James. Certain letters survive amongst members of the family, and these give occasional glimpses into the more personal sides of the life of this clockmaker, which would otherwise never have been known. It is clear from one letter that John's son, Joseph, had a serious breakdown in the relationship with his father, a factor apparently brought about, or aggravated, by John's second marriage to a much younger woman. We probably all of us know of similar situations. Remarriage late in life can bring into doubt all kind of issues, not least the question of who inherits any monies when the father of the family dies. John's son, Joseph, was born in Gargrave in 1805, presumably learned clockmaking under his father, but had moved away to work as a clockmaker in Leeds by 1850. He was probably there a little earlier as I have a note of a bracket clock signed J. S. Briggs, Leeds and dated 1847. His brother, Leonard, remained in Gargrave as a mechanic at the spinning mill. A letter written from John Briggs, the son of James, brother of the clockmaker, (in other words the clockmaker's nephew) in 1850 to his brother, Isaac, includes the following reference to Joseph of Leeds: 'I enclose a letter I received this morning from cousin Joseph, in Leeds. It will hurt your feelings very much to read the very, very hard expressions he makes use of towards Uncle. I am afraid he has had too much cause to be seriously offended, but I would much rather he would attribute part to old age, and use better and kinder words towards his aged father. I also fear Uncle John has no bed of roses from his second choice, and we will hope Joe paints it too black.'. Joseph and Leonard Briggs, John's two surviving sons, are believed to have emigrated to America about 1850. This is a bit puzzling as there is a John S. Briggs listed as a clockmaker at Quarry Hill, Leeds in 1866, but this might just be a different and quite unconnected person. Joseph (perhaps together with Leonard) is believed to have invented what was described as a 'rotary engine' in the Surveyor and Architect Magazine of 1840. Isaac Briggs, a second cousin of Joseph and Leonard, wrote about 1920: 'Father only saw them once (his father, also called Isaac Briggs, was cousin to Joseph and Leonard and lived in the Meanwood area of Leeds at the time of the incident described) - when he went to see an exhibition of their patent rotary engine. Father often told the tale'. He quotes from the Surveyor and Architect Magazine of 1840 a piece which they seem to have taken from the Leeds Intelligencer newspaper. American records show a John C. Briggs working as a clockmaker in Concord, New Hampshire from about 1855 to 1870, during which time he took out certain patents on 'rotary' clocks. These were made by George W. Brown of Bristol, Connecticut, who 'made a speciality of rotary clocks and it is claimed that they are the only American makers of reliable clocks having this escapement'. American records also show L. C. Briggs of Boston, Mass. Working from about 1865 to 1878. This could well be the other son, Leonard. The initial C. might just stand for Coates, his mother's maiden name. I was not at all sure what a clock with a 'rotary' escapement might be, but wondered if it might be another name for a torsion escapement, used on that type of clock with the swinging balls. I asked that fount of knowledge on such things American, Tom Spittler, and he came up with the answer in minutes. A rotary escapement, it seems, was one which used a pendulum bob suspended from a wire, and, which, when given impulse, would cause the bob to rotate in a circular motion, describing a circle - unlike a torsion bob which spun on its own axis. Raising or lowering the bob by shortening or lengthening the wire would effect faster or slower regulation. What happened to the rotary engine, I don't know, but the rotary escapement can hardly have been by some other unrelated person who happened also to be called Briggs! 3. Dial of the thirty-hour Skipton clock after restoration. The arch scene may be biblical, but has not been identified. Click for closer view. 4. Musical bracket clock signed by John Briggs of Skipton. Click for closer view. 'My great uncle, John Briggs of Skipton and Gargrave, was a famous clockmaker at the end of the 18th century. He was born in 1770 and died at Skipton 1853. His business was originally at Skipton. I have reason to believe he succeeded an uncle, William Briggs, in the business. Early in the 19th century, or at the end of the 18th century, Skipton declined very much, and with the building of the Leeds and Lancaster canal, Gargrave grew into a prosperous place, and he either moved to Gargrave or had a branch there. My family had many of his 8 day and bracket clocks. The oldest, with a painted face, is in a very old painted case (Dutch) and bears the name 'William Briggs, Skipton'. This would be late 18th century. My sister has the grandfather clock, one day, in plain cottager's case, that belonged to John Briggs, an older brother. My grandfather James Briggs born 1766, died 1844.
and 4. My brother also has a very handsome 8 day grandfather, and an equally ornate bracket clock by John Briggs, probably 1820 to 1840 period. Another brother of mine has one with a narrow case, a charming clock by John Briggs. I possess four of his clocks: A very handsome case, oak, with beautifully chased brass face and revolving moon showing the changes. A bracket clock probably between 1790-1815. A plain cottage grandfather with painted face, a wide, so-called debased Yorkshire case, but in excellent condition. I know the pedigree of this clock; it dates back to between 1840-50. John Briggs seemed very sure about his ancestor William. This is puzzling as no such clockmaker has been recorded elsewhere, and it seems this may have been an error. It is also puzzling that he mentions a bracket clock by John Briggs, which he owned, and one which his brother owned. These may have been one of the two bracket clocks described below, or may have been a quite different, third and fourth example. These bracket clocks belong strangely to a period earlier than the working dates we know for John Briggs. It is also odd that the brass dial moon-rolling longcase he describes too belongs to an earlier period, for by 1790 brass dial clocks were pretty well extinct in this area. It is just conceivable that a customer placed an order with John Briggs in the 1790s for a brass dial example, even though these were then very much out of fashion, but it is another odd aspect. Two bracket clocks are known today signed by John Briggs of Skipton. One is described as a three-train musical clock in an ebonised case with brass fittings and caryatid figures and appears to date from the third quarter of the eighteenth century, far too early to have been made by the only known clockmaker called John Briggs. It is possible that it is an older clock which John Briggs came by, re-furbished, and sold on with his own nameplate replacing that of the original maker. One source suggests that the original maker may have been Stephen Rimbault of London, but this may have been no more than a guess based on the fact that Rimbault is known to have made musical clocks at this period - but he was by no means the only one. Certainly it is very unlikely that musical clocks were the product of a provincial maker such as John Briggs, even if the style of them had been in period. Little is known about the other bracket clock, except that it was sold in Sothebys London rooms at an unknown date pre-1988 and had a verge escapement, plain backplate, strike/silent switch in the arch, and was signed in the pendulum aperture. This clock also sounds too early to have been made by John Briggs, and it is again possible that it was an older clock which Briggs re-sold. Moreover the quality of work in these two bracket clocks is much higher than that evidenced by John Briggs's own longcase clocks, which are competently made but pretty basic. The same may have applied to the brass dial rolling moon clock. Could that too have been one re-cycled by John Briggs? 5. The sundial above the door of the former Post Office in Middleham Market Place (now known as Sundial House), made by John Briggs, now repainted to initials only and the date re-painted as 1778, formerly 1798. Click for closer view. So here we have a nicely rounded picture of a clockmaker in a country town around the middle of the nineteenth century, and some idea of the kinds of clocks he made, and perhaps those he re-sold as if made by him. But what makes John Briggs more interesting than most is the unique glimpse into his personal life and those of his estranged sons, things we know purely because of the genealogical interest taken by present-day descendants. If there are any American Briggses out there who descend from Joseph or Leonard and who can tell us more of the story, we would like to hear.